Lieutenant Commander Terry J. Tassin, United States Navy, retired, was born in Cottonport, Louisiana during 1940. He enlisted in the United States Navy in January 1959 and rose to the rate of Second Class Petty Officer serving as an Explosive Ordnance Disposal (EOD) Technician and deep-sea diver. He attended the Officer Candidate School at Newport, Rhode Island in August 1964 under the Navy’s Integration (Seaman to Admiral) Program, and was commissioned in December 1964. Commander Tassin’s shipboard assignments have included destroyers, cruisers, battleships, and aircraft carriers. He served a one-year tour of duty as the Senior Naval Advisor to Vietnamese River Assault Group 28 (RAG 28) from July 69 to July 70 and was awarded the Bronze Star for Valor. 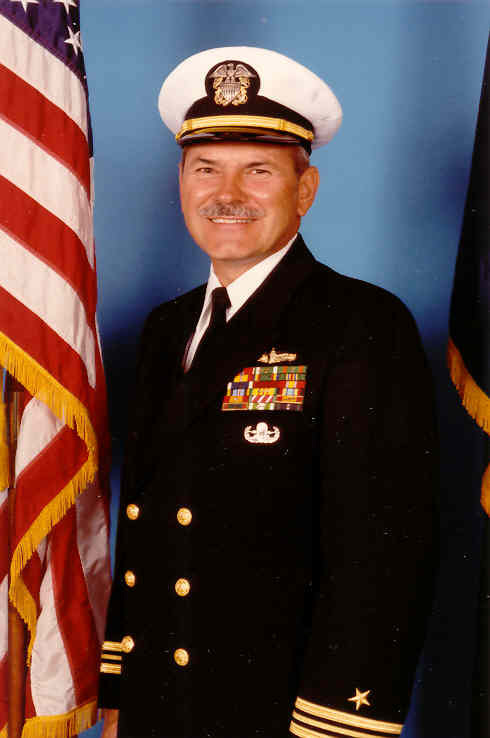 Commander Tassin’s shore tours of duty included the responsibility of overall military training of all Navy recruits at the Recruit Training Center, San Diego, California. His final two years of active duty was on the staff of the Commander, Operational Test and Evaluation Force in Norfolk, Virginia, where he was the Operational Test Director for Surface to Air Missile Systems. Commander Tassin retired from active duty after twenty-two and a half years of continuous service in August 1981. He subsequently assumed the position of Senior Naval Science Instructor at the Apollo High School Navy Junior ROTC Unit in Glendale, Arizona. Under his guidance the unit was rated in the top 20% of all NJROTC units in the nation each of the twenty years he functioned as Senior Naval Science Instructor. In 1991 the Apollo unit was recognized by the Navy and the Navy League of the United States as the most outstanding NJROTC unit in the nation. On 1 July 2001, after twenty years of teaching Naval Science, Lieutenant Commander Tassin retired from the position of Senior Naval Science Instructor for Apollo High School in the Glendale Union High School District. Joining the Arizona Chapter MOAA in 2001, he became active in Chapter affairs, holding offices of Chapter Secretary, Newsletter Editor, and served as Chapter President for two years from January 2007 to January 2009. His hobbies include golfing and bass fishing. He is married to the former Frances Brownell, of Wilmington, California. They have two children. Commander Tassin was inducted into the Arizona Veterans Hall of Fame as a member of the Class of 2002.